Without a doubt, Los Angeles is a predominant player in the fashion world. Known for our fashion-forward luxury boutiques, this is a city where everyone is seeking to be on the cusp of the “next big thing.” From high-end designers or smaller boutiques, shopping in Los Angeles is both unique and gratifying. The city hosts a location for all the major brands, but for those seeking a “curated” shopping experience, smaller brands are the way to go. Below I break down the city into shopping neighborhoods and highlight stores that can’t be missed! Beverly Hills is the hub of shopping activity, not only in Los Angeles, but in the world. From Rodeo Drive to Wilshire Boulevard, there are shop signs everywhere that catch peoples attention and draw you in! There are shops that will please every buyer’s palate. Home to one of the most famous shopping streets in the world, Rodeo Drive is the ultimate destination for luxury labels. From Bulgari to Cartier to Prada to Versace, many top designers are conveniently situated on three and half blocks of pure shopping heaven. Beverly Hills also is known for its big department stores, like Barney’s New York, Saks Fifth Avenue, and Neiman Marcus, all perfectly positioned Wilshire Boulevard. Male shoppers rejoice! Women are not the only ones who luck out in Beverly Hills. For men looking for custom suits, but not crazy high-end prices, Indochino Custom Menswear is the place to shop in Beverly Hills. Their flagship showroom is conveniently located right on Little Santa Monica. With suits ranging from $400-$800 and shirts a standard $129, Indochino also takes appointments in 30 and 60 minute blocks, making make buying quick and reasonable. You may even be able to find some coupons to make shopping a bit cheaper. A lot of people like to save on Groupon by getting discounts for popular high-street stores and restaurants. There are loads of online sites that you could use though to help you save money on your purchases. For example, you could check out something like these ebates coupons to give you a better idea of what else could be offered to you. Of course, just outside of Beverly Hills, there are a slew of other shopping destinations. Melrose Avenue and Robertson Boulevard are peppered with High-Street Fashion options. Melrose is lined with favorites like Vivienne Westwood, Paul Smith, Marc Jacobs, Fred Segal, and Alexander McQueen. And yes, even the DASH store has a location on Melrose, for those Kardashian fans. There also are a handful of vintage stores to explore like Cameron Silver’s Decades, hands-down one of the most famous vintage clothing stores in the world. Whether one is looking for classic Chanel, an amazing Dior dress from the 70s, or pre-2000 pieces by Gucci, Valentino or Versace, they will have it. Further east on Melrose, the stores become more casual and are geared towards street and urban-wear. A real destination for shoe lovers is Sportie LA. Just as the name implies, Sportie LA is known for their huge selection of sports and casual shoes. Literally stocked floor to ceiling, they carry every brand that can be squeezed under one roof, like Adidas, Puma, and Vans. Robertson Boulevard is an equally exciting shopper’s dream. Notable stores include Intermix, Ted Baker, AllSaints, and Reiss. The most celebrated store in the area is Madison LA, with their flagship store centrally located at 3rd street and Robertson Boulevard. A great place to start one’s shopping adventure, Madison LA offers a selection of contemporary and designer clothing, shoes, and accessories that are wearable and classic. Since they hand pick their pieces, one can find various designers all under one roof featuring styles that range from the everyday to the professional to a perfect evening look. Shopping might not be the first thing that comes to mind when one thinks of Hollywood, but there are several great locations to shop in the neighborhood. Starting with the Hollywood & Highland Center Complex, there are stores ranging from Victoria’s Secret to Lucky Brand Jeans. 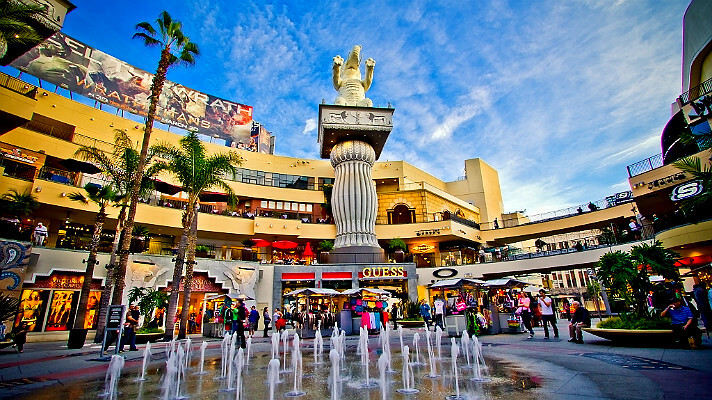 The stores are casual, but busy as this is the ultimate tourist destination in LA. More unique to Hollywood are the various vintage stores, like Golyester, Jet Rag, Buffalo Exchange, and the most impressive Iguana Vintage. With three stories chock-full of vintage goodness in the heart of Hollywood, Iguana Vintage Clothing is the place to go for retro styles or to snag that perfect Halloween costume. It feels a little like stepping into a time warp. The prices are fair, from $5 handbags to $45 leather jackets to $100 plus for select high brand items. Wigs, uniforms, floppy hats, vintage tees, and old records are neatly organized by decade, style and color. Be sure to put extra money in the meter when you park, you’ll need the time to go hunting! Another great shopping area in Hollywood is Larchmont. This neighborhood street is fun to explore, especially on foot. With local bagel shops, incredible pizza, a variety of international cuisines, as well as yoga and spin studios, Larchmont offers a bit of everything convenient to those living in the surrounding Hancock Park community. Along Larchmont there are plenty of clothing stores, from local fashion curators to more specialty selections. A personal favorite of mine is Kicks Sole Provider. This boutique offers an array of sneakers for men, women, and kids. They have various brands, but the one thing in common is their level of cool. From sequined Toms to leather Converse All-Stars to highly-sought-after Nikes, Kicks specializes in limited edition shoes and accessories. Cool off after a day of shopping with some of the best ice cream in the city at Salt and Straw located just across the street. 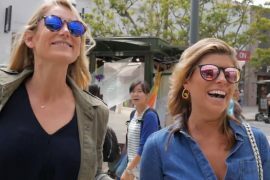 Shopping in Santa Monica and Venice is vastly different than in the rest of Los Angeles, mainly because it is so heavily influenced by the beach community. Third Street Promenade and Santa Monica Place are anchor destinations on the west side. Stores range from the usual brands, like Gap, Abercrombie & Fitch, and Urban Outfitters on the Promenade. Santa Monica Place offers more high-end brands, and even a Barney’s Co-Op, which has all the high end brands you would find at a regular Barney’s department store, like Armani, Bottega Veneta, and Stella McCartney, for a fraction of the price. Other streets worth a visit are Montana Avenue and Main Street. Montana Avenue shops span over a 10-block stretch in the northern part of Santa Monica. The boutiques specialize in beachy-chic, with highlights like London Sole, The Blue Jeans Bar, Planet Blue, and Jurlique’s Skin Bar. Main Street has a more laid-back collection of stores like Free People, Bryn Walker, Love Adorned, and an incredible shop full of American made crafts and gifts called Mindfulnest. In Venice, Abbott Kinney is an idyllic, palm-tree lined, quaint street is brimming with local artists, fantastic restaurants, and unique stores. Biking is both the mode of transportation as well as the accessory of choice while you cruise the stores known for one-of-a-kind goods. Stop in Marine Layer for the softest shirts, Principessa for the best in bohemian wear, and Satine for unusual luxury designs. Alexis Bittar also has a storefront on Abbot Kinney. Known for her special namesake designs, her jewelry is high on style and reasonable on prices. Malibu and the Pacific Palisades have their fair of luxury and boutique stores. After all, considering the residents, it is only a natural fit to have shopping options to meet the needs and tastes of their immediate clientele. The Malibu Country Mart and the Malibu Lumber Yard are high-end retail destinations. One can rub elbows with celebs while shopping at the Country Mart at stores like Michael Stars, Chrome Hearts, and John Varvatos. Located just next door is the Lumber Yard, featuring James Perse, Lorna Jane, and AllSaints. Not too far away, in the residential neighborhood of the Pacific Palisades a few stores populate the downtown area. Benton’s Sports Shop for sporting goods, Black Ink for boutique stationary, and Flash Jewelry for unique wearable jewelry designs, are all located right within the heart of the Palisades. The most notable store in the area is Elyse Walker. Since she has only one boutique, Elyse Walker is a great place for those looking for a more one-of-a-kind shopping experience. Specializing in clothing that is effortlessly casual with a metropolitan vibe, this store houses everything from Alexander McQueen evening gowns to Prada flip-flops. The store was initially opened to appeal to those living in Malibu and the Palisades who wanted luxury fashion without making the trek into Beverly Hills. Now everyone from Beverly Hills wants to make the drive to the Palisades to discover all the delightful threads that Elyse Walker curates to dress the racks under her roof.